Here are our most often asked questions with answers. If you do not find your answer here or on our FAQ page please contact us through the form below. This video will demonstrate how to use the .rar files from your download. Taiko Creator, Shimmer Shake Strike, Riff Generation, Fluid Harmonics and Fluid Strike are the only In Session Audio libraries that require Native Instruments’ Native Access application for installation. This video demonstrates all installation steps, as well as the solution for the most common issue. Please follow the below guide for any other In Session Audio Kontakt library. In this example we are using the Lowdown Groove Guitar library but the steps are the same for our other libraries. There is no formal installation process to begin using the patches and loops in Kontakt. Simply use Kontakt’s file browser tab to navigate to the Lowdown Groove Guitar – Kontakt folder (shown below). Click on any of the files ending in “.nki” to load a patch. 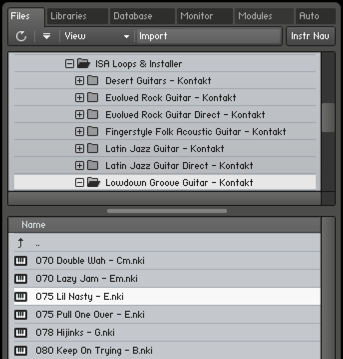 Alternatively, you can drag and drop any of the .nki files directly from the Lowdown Groove Guitar – Kontakt folder into Kontak’s main patch window. Note: Kontakt’s “Add Library”, “Manage Libraries” and load from “Libraries” functions are not available options for Lowdown Groove Guitar or any of our other libraries. This functionality is reserved for locked “Powered-by-Kontakt” libraries only. All In Session Audio Stylus RMX loops have ben pre-converted to the Stylus RMX format. There is no need to use RMX’s S.A.G.E. Converter. To use the loops, place the loop library folder or demo loop folder into Stylus RMX’s User Libraries folder. Note: The ProgramData folder is normally a hidden file. To “Show Hidden Files” go to the Start Menu/Control Pane/Appearance and select Folder Options/View tab. Select the “Show Hidden Files and Folders” option and hit “Apply”. Note: The Library on Lion 10.7 and up hidden. 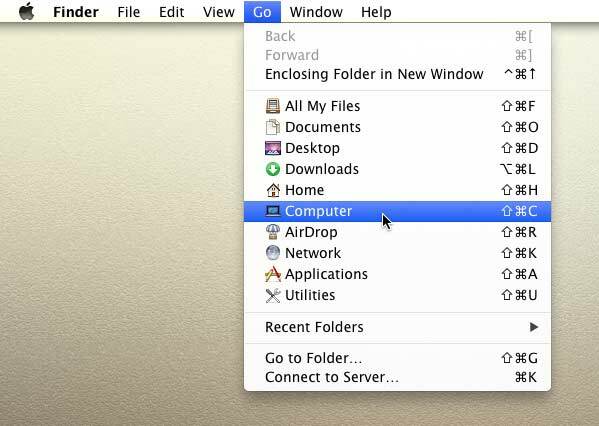 To access it, in the Finder go to the “Go” menu and hold down the Option (Alt) key; the Library folder will then appear as a choice.